If you read my last post about the must-have handbag designed by Jordana Paige, you'll know that I cannot get enough of the Cora handbag's versatility. I love that the bag is classic in its color and design. It's what makes it easy to style up or down. And the bag is so beautifully made with great quality. When searching for an "investment piece", those are qualities you always want to look for. Not only is it the best casual weekend carry-all handbag, but it's absolutely perfect for your workday! 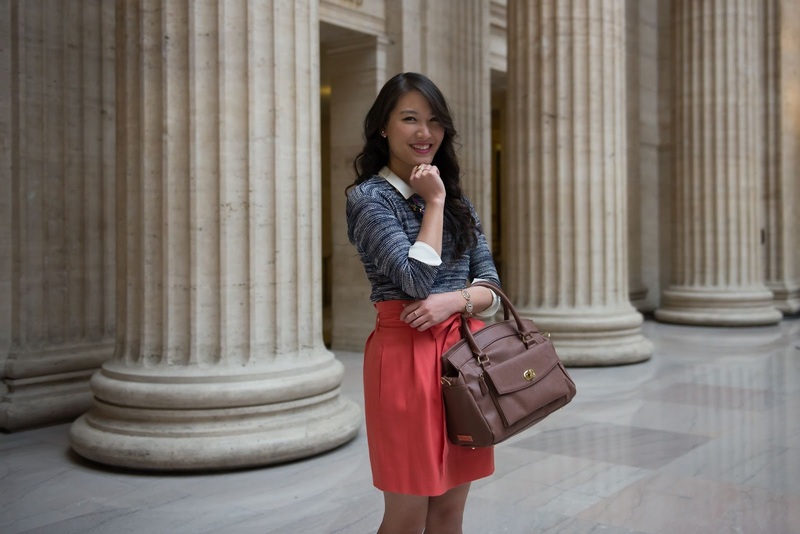 Because the color of the bag is so classic, it's simple to add bright colors to create a fun work look. I chose to complete this outfit with a bold skirt and statement necklace. Special thanks to Jordana Paige for sponsoring this post. The opinions expressed here are my own. This outfit is stunning! I love the orange skirt with the grey sweater. And the bright necklace is just a perfect touch. This outfit is absolutely stunning!!! And what a great idea to shoot in the train station - so luxe and lovely!! So, so cute! Love everything about this look! The color of that skirt is so fun! SO CUTE! LOVE everything about this!! This outfit is so cute and I really like the color of your skirt! Love this outfit! So cute!! This look is very cute, I love your skirt and the shoes add a vintage feel to look which I love. Definitely a beautiful bag but I am dying over that skirt! I love the pretty bow! This outfit is hands down beautiful. I love everything about it and the pictures are stunning. Lovely! How much do I love your gorgeous skirt - It's the most beautiful colour and I love how you've styled it. I just love this look, very pretty skirt! Such a beautiful, ladylike look! I love the fun necklace you layered on your top. Beautiful skirt and you look absolutely gorgeous in this outfit. Love the versatile bag, I carry one very similar to work everyday, and it can hold just about everything. 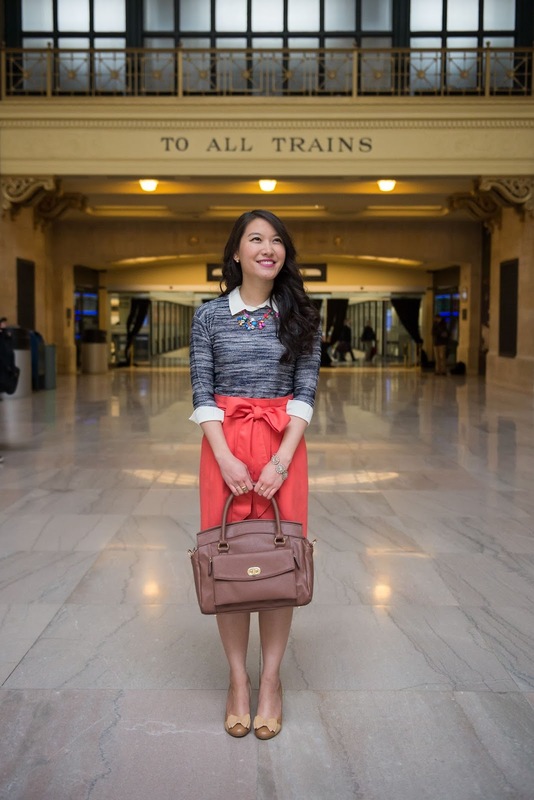 Its so useful to have carryalls that are work and weekend appropriate..
What beautiful photos, I love this bow skirt. so pretty, love that last picture~!